Client: Ralph Marks (Builders) Ltd. The historic building was built in 1905 for Thomas Brecknock, and is of special historic interest due to its inclusion in a key gazetteer of industrial archaelogogy, as part of a network of cotton spinning/lace factories since the late 17th Century. Our client, Graham Marks of Ralph Marks (Builders) Ltd, asked us to quote for the re-decoration works to the Mill as part of an overall grant-aided Townscape Heritage Initiative scheme to protect and preserve the historical building as part of the town’s heritage. The works also included to restore the roof, walls, cast iron window frames and drainpipes. 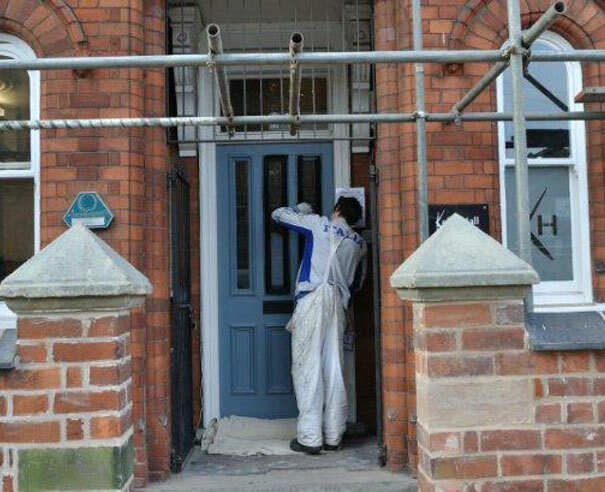 Our remit was to clean down, patch repair and re-paint the original cast-iron windows (internal and external) and one door using flexible primer, undercoat and gloss to the colour specified by our client. We also re-decorated low roof fascias and rainwater goods. Works were successfully completed in December 2011 – and the restored building is back to its former glory.